How balancing failures are actually extending U.S. hegemony. In 1990, Charles Krauthammer declared a “unipolar moment,” arguing that “the center of world power is the unchallenged superpower, the United States.” To many observers, the word “moment” (or “illusion”) seemed an apt description of the durability of U.S. hegemony. International Relations (IR) theory—especially neorealism—predicts that the unbalanced power of a unipolar international system should catalyze the emergence of new great powers and a quick return to balance-of-power politics, in order to limit the power of the preeminent state and restore the system to its “natural” state of multipolarity. Today, many analysts believe that this neorealist prophecy is coming true and that unipolarity is coming to an end—even if the “moment” lasted longer than originally expected. The 2008 global financial crisis revealed cracks in the economic foundations of U.S. hegemony, especially when compared to a number of more spritely “emerging economies.” The United States also shows signs of “war weariness” after over a decade of military escapades in Afghanistan and Iraq—evidenced by its more restrained military policy with respect to political instability in the Middle East (e.g. Libya and Syria), and the transition of its “War on Terror” into a drone war waged from a Nevada bunker. Most importantly, the long-awaited return to balance-of-power politics has finally arrived: two champions, China and Russia, have emerged to counter-balance the United States and restore proper equilibrium to the international system. Right? Russia was first to adopt a balancing strategy against the United States. Over the past decade Russia has repeatedly demonstrated its willingness to use coercive diplomacy against its neighbors (e.g. cyber attacks against Estonia, and gas pipeline diplomacy against Ukraine) in order to prevent the expansion of NATO and the European Union into what it considers to be its natural sphere of influence. More recently, Russia’s balancing strategy includes the use and threat of military force in pursuit of revisionist aims in Eastern Europe and the Caucasus. In the fall of 2008, Russia engaged in a large-scale military offensive against the post-Soviet Republic of Georgia and occupied the pro-Russian separatist provinces of Abkhazia and South Ossetia. The Russo-Georgian War was the first clear signal of Russian balancing, which sought to halt the United States’ plans for NATO expansion and not through the “soft balancing” of diplomatic statements in the United Nations Security Council, but through an overt demonstration of military force. President George W. Bush called the action an “unacceptable” invasion of a sovereign neighboring state and the United States placed sanctions on Russia. The Obama administration’s early attempts at diplomatic rapprochement with Russia produced some limited successes, most notably the New START Agreement for nuclear reductions. However, the essential incompatibility of U.S. and Russian interests meant that this rapprochement was short-lived. With Vladimir Putin’s resumption of the presidency, Russia effectively said “no thanks” to further strategic nuclear reductions and instead appears committed to modernizing its military capabilities, including its nuclear forces. The Russians even skipped the 2016 Nuclear Security Summit in Washington, DC. Meanwhile, Russian balancing and revisionism have clearly escalated in recent years, with its military interventions in Ukraine and Syria being the most compelling examples. In response to the Ukrainian revolution in 2014, Russia annexed the strategically important Crimean peninsula and provided covert military support to pro-Russian separatist rebels in the eastern Donbass province of Ukraine. In September 2015, Russia also expanded its military support to the Syrian government through an air campaign that targeted U.S.-backed rebel forces, along with ISIS militants. In Russia, Putin is believed to have “saved Syria” from U.S.-led regime change. Both of these events clearly demonstrate Russia’s commitment to “hard” balancing against the United States. However, Russia’s balancing strategy has to a large extent proven to be counter-productive. Instead of preventing the expansion of NATO through a “divide and conquer” strategy, or driving a diplomatic wedge between the United States and Europe, Russian revisionism has united NATO and the European Union behind the United States. The United States and the European Union responded to the annexation of Crimea by placing economic sanctions on Russia. Furthermore, NATO member states have increased troop deployments and military exercises near the frontier with Russia. The United States has also announced plans to quadruple defense spending to support increased troop deployments in central and eastern Europe. Perhaps most illustrative of all, a number of the post-Soviet republics now increasingly look toward the United States and NATO for security, including Ukraine and the Baltic states of Latvia, Lithuania, and Estonia. Ukraine has even announced that it is open to considering a ballistic missile defense option in its territory, and Ukrainians growingly support NATO membership for their country. Overall, Russian balancing has strengthened the United States’ political influence and military presence in Europe. In September 2012, the longstanding sovereignty dispute between China and Japan over the Senkaku/Diaoyu islands in the East China Sea escalated when the Japanese government purchased the islands from a private owner. China’s People’s Liberation Army Navy (PLAN) responded by sending patrol ships to “assert the country’s sovereignty.” In November 2013, tensions escalated even further when China unilaterally declared an “Air Defense Identification Zone” over the East China Sea. China has also moved to reinforce its maritime sovereignty claim over the entire South China Sea—including the Paraceland Spratly Islands, as well as Scarborough Shoal, based on the the so-called “nine-dash line”—by actively increasing its military presence. In 2014, China began the construction of a number of “artificial islands” in the disputed South China Sea, which can receive both military vessels and aircraft. Recent reports suggest that China has a specifically military intention for these islands, with satellites detecting the presence of missiles and military aircraft. Furthermore, China’s military modernization is moving forward at an amazing pace. According to the International Institute for Strategic Studies, China was responsible for 63.4 percent of the increases in regional defense spending in 2014, with double-digit increases in spending despite its slowed economic growth. One important area of China’s military modernization has been its development of so-called “anti-access/area denial” capabilities (A2/AD)—such as conventional submarines, short and medium range fighter aircraft, and “carrier killer” ballistic missiles—that are designed to increase the risks to costly naval assets, like aircraft carriers, in the event of a U.S. military intervention in the East and/or South China Sea. Another important area is China’s ambition to develop a blue-water navy, with PLAN operating in waters further away from home, and the announcement that China intends to indigenously build a second aircraft carrier. However, instead of undermining U.S. influence and forcing states to “bandwagon” with China, Chinese revisionism is actually strengthening the U.S. alliance system in East Asia. The United States is in the process of upgrading its strategic cooperation with several of its longstanding allies, such as Japan, the Philippines, and Australia. The Obama Administration’s “Pivot to Asia” policy has sought to reassure U.S. allies of its enduring political commitment and military presence in the region. Recent evidence of the Pivot includes a number of port visits by the U.S. navy to its allies (e.g. Manila in March 2016), some high profile arms sales (e.g. the $1.8 billion arms deal with Taiwan in December 2015), and even new force deployments to the region (e.g. the plans to deploy long-range bombers in Australia and to gain access to five military bases in Philippines). Second, the United States is developing new strategic partnerships in East Asia, which could become full-fledged U.S. allies in the future. Anxiety about China’s rise is leading a number of ASEAN member states—such as Singapore, Malaysia, and Indonesia—to increasingly look toward the United States for security. Together, Singapore and Malaysia represent a geostrategic pivot for exercising control over the Straits of Malacca and thus their entrance into the U.S. alliance system would represent a major constraint on Chinese power. Perhaps the most surprising of the United States’ new security relationships is with Vietnam. In a manner consistent with the realpolitik maxim that in international politics “there are no permanent friends or enemies, only permanent interests,” the diplomatic rapprochement and security dialogues between the United States and Vietnam demonstrates the extent to which Chinese revisionism is pushing China’s neighbors toward the United States. The U.S.-India relationship has grown in recent years, with the United States’ de facto recognition of India as a legitimate nuclear power and the agreement on a new U.S.-India Defense Framework. The India-Japan relationship has also grown, with defense ministers agreeing to expand strategic cooperation in 2014. Yet the clearest symbol to China of the potential for a trilateral alliance is no doubt the Malabar naval exercises between India, Japan, and the United States. In 2015, Japan became a permanent member of the annual naval exercises in the Bay of Bengal, which had previously been a bilateral exercise between the U.S. and Indian navies. The Malabar naval exercise was an overt attempt to blunt China’s growing naval capabilities and its presence in the Indian Ocean. Of course, the movement toward a formal trilateral alliance will depend on the extent of the perceived threat from Chinese revisionism. International observers at the end of the Cold War predicted that the unipolar international system characterized by a single superpower, the United States, would be short-lived—a mere “moment” between the collapse of the Soviet Union and the rise of new great powers. This prediction had its basis in the neorealist version of balance-of-power theory, which suggests that states in an anarchic (“self-help”) international system compete for security and survival, leading inevitably to a balance-of-power. The movement of China and Russia toward strategies to counter-balance the United States during the past decade seemed to foreshadow a return to a multipolar balance-of-power, and vindicate the claims of neorealism. The reason is that China and Russia are seeking to increase their relative power through regional revisionism, especially through the use or threat of military force in the pursuit of territorial gains. States in East Asia and Europe have therefore interpreted Chinese and Russian revisionism as major security threats and responded by strengthening the U.S. alliance systems in their respective regions. The result is an increase in the United States’ political influence and military presence in East Asia and Europe, and the continuation of the unipolar moment. Fortunately, IR theory—and even neorealism—does have an explanation for this counter-intuitive result: balance-of-threat theory. In The Origins of Alliances, Stephen Walt says that states do not balance against power, per se, but rather against threats. Walt argues that security threats are defined by a combination of factors, including the aggregate power, proximity, offensive capabilities, and offensive intentions of other states. Walt’s balance-of-threats theory goes a long way toward explaining the enduring character of the U.S. alliance systems, as well as why states in East Asia and Europe look to the United States for security against China and Russia. While U.S. preponderance is unprecedented and its relative power advantage is likely to endure for the foreseeable future, the United States is sufficiently far away from East Asia and Europe to make territorial conquest improbable, and its military presence is widely perceived as a source of stability rather than a threat. This at least is the view held by U.S. allies. On the other hand, China and Russia are not seen in the same way in East Asia and Europe: they are the giants next door, with growing military capabilities and demonstratively revisionist aims. Chinese and Russian balancing strategies have therefore backfired—they have pushed their neighbors into the orbit of the U.S. alliance systems. 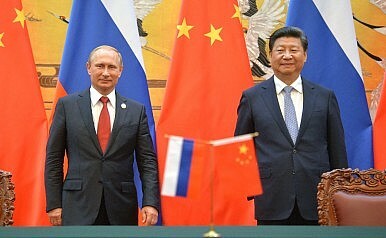 China and Russia’s shared goal of a return to multipolarity would have been better served by continuing with “soft balancing” strategies, which emphasized the injustice of international institutions based on U.S. interests, the failures of the liberal values of democracy and capitalism to promote global peace and prosperity, and the hypocrisy of the United States’ military interventions and use of force that violates international law. Unfortunately for China and Russia, it would be hard for them to change the course of their foreign policies now that they are committed to the path of hard balancing. First, it would be difficult to convince their neighbors of the credibility of their benign intentions (e.g. China’s “peaceful rise” discourse), after their use and threat of military force in pursuit of territorial aims. Second, it would be a challenge to escape the security dilemma logic that has taken hold: each side perceives the other as a threat and seeks to increase their security by augmenting their military power, which only serves to confirm the other side’s suspicions of hostile intentions. Third, an abrupt policy change by China or Russia would likely be viewed both domestically and internationally as a defeat, which neither Beijing nor Moscow is likely to accept. Thus, China and Russia will most likely continue down their current paths of balancing through revisionism, which will only strengthen the U.S. alliance systems in East Asia and Europe, and therefore the unipolar moment of the United States’ geopolitical preeminence will endure. The future of U.S. grand strategy may therefore not be found in the concept of an offshore balancer, but rather an offshore hegemon. Nathan A. Sears is Professor of International Relations at the Universidad de Las Américas, Quito-Ecuador. His research focuses mainly on strategic studies, international security, and international relations theory. A year later, does the argument of reinforced U.S. hegemony hold up?